The "X Table" is a sturdy and simple table. It's made out of 100% plywood. It assembles with simple furniture bolts. No glue, nails or other permanent fasteners are required. It can be shipped flat, setup, and easily taken back apart again. It features a removable "dog bone" in the middle that reveals a tray. You can put your computer power supplies and other wiring on this tray. This makes it a great desk or meeting table. The X Table is a simple and sturdy table. In 42" height it makes an generously sized standing desk/conference table. At 36" high 4-5 people can sit comfortably and work. Each table features a wiring tray mounted underneath that houses all of your charger bricks. A removable slot on the top of the table allows you to pull all your cords up for easy reach. 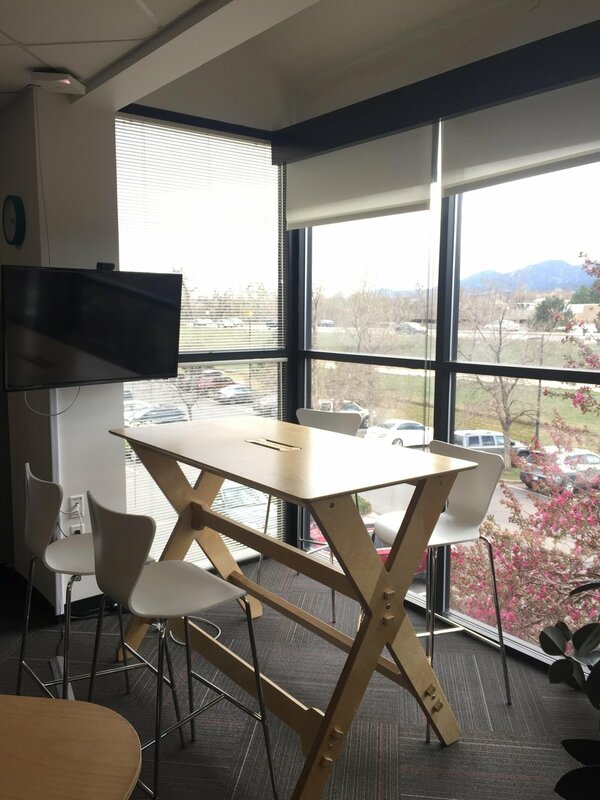 The table can ship flat and be assembled with a single Allen key by one person in about 15 minutes. Want to fabricate one of these for yourself? All you need is your own CNC machine, or access to one at a local fab lab or makerspace. 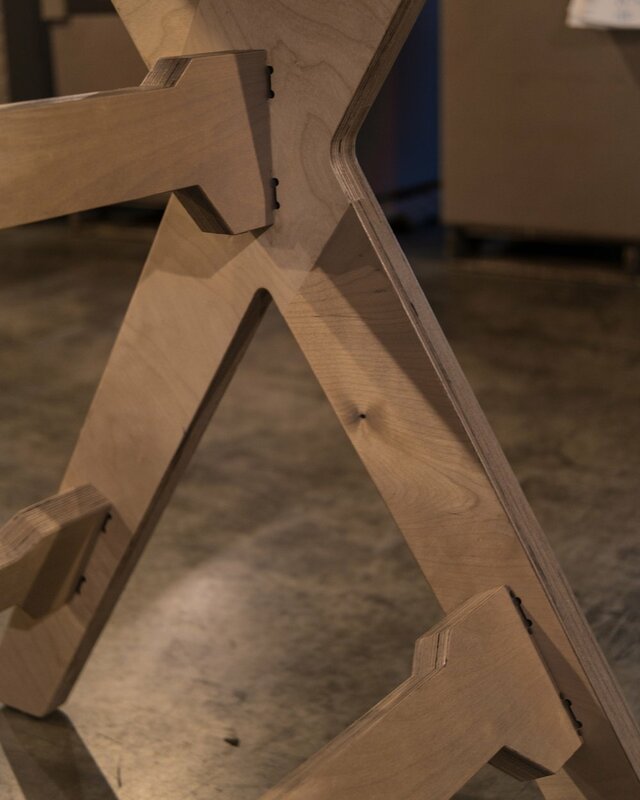 This table can be fabricated using two sheets of 3/4" plywood. 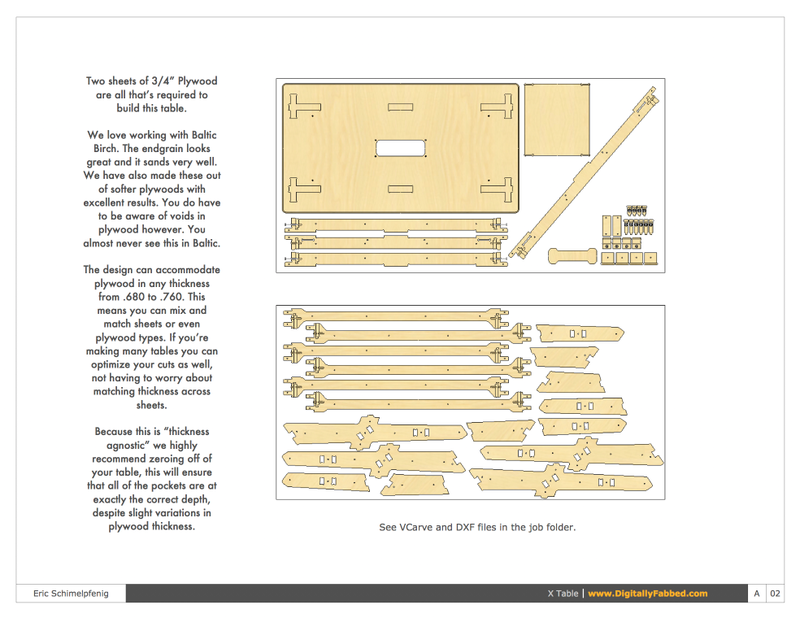 The table was carefully designed to use any thickness of 3/4" plywood. The hardware is cleverly designed so that the table can be easily assembled and disassembled using only a single Allen wrench. This makes it easy to transport or ship. The table and design carry a non-commercial license: https://creativecommons.org/licenses/by-nc/4.0/. Please read the license before downloading the files. Essentially the license allows you to download the design and make it for non commercial use. If you'd like to make and sell your own, please contact us for a commercial license.